Salem High School Alumni Association Committee members Dot & Charlie Bunting, selling donated yearbooks during Market Street Day in Salem. Proceeds benefit scholarships given each year to Salem High School graduates. The Alumni Association is comprised of all students who have graduated from Salem High School. The first members graduated in 1875. We are the oldest continuously active alumni association in the state. The officers and executive committee members listed above oversee the activities of this organization associated with the high school and other local happenings. We have business meetings 3 to 4 times a year. The Primary objective of the SHS Alumni Assoc. is to provide educational scholarships for graduating seniors. Secondary objectives are to support all high school activities, extra curricular programs and athletics as funding is available. Honor the oldest living graduate each year at graduation time. We are always seeking information on the oldest living graduates for our records - please call if you know of anyone. If you have or know people that have old yearbooks that you/or they do not know what to do with please donate them to us. Wooden plaques of the old (built in 1912) and new (built in 1971) high schools. The cost is $15.00 each. These make nice gifts or door prizes for reunions. Banners from past Tri-County and State Championships from the gym walls of the high school. Call for information and pictures. These are great one-of-a-kind items for your game room or basement decoration. Seat Sections from the old high school (Market St.) Auditorium. Great conversation pieces and a part of history. ​We accept all donations from individuals-estates-businesses for our scholarship fund. Various class reunions have provided in the past. We are currently working with the Salem County Historical Society to reserve a special meeting room in the Historical Eakin House on Market Street to display memorabilia from past classes and the Alumni Assoc. Several items have already been donated and categorized for display. Projected use of room will also be for alumni meetings & class reunion meetings. We are seeking old and unique class memorabilia (sweaters - jackets-athletic letters-band uniforms-athletic uniforms-class rings-graduation programs-pictures-mugs-pins-ties etc.) for this project. If you have and would like to donate that "special" cherish item please contact us. 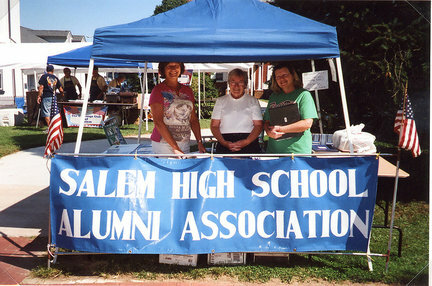 The Salem High School Alumni Association Committee, Lyn McConnaughey, from left, Dot Bunting and Barbara Peterson, selling donated yearbooks during Market Street in Salem.